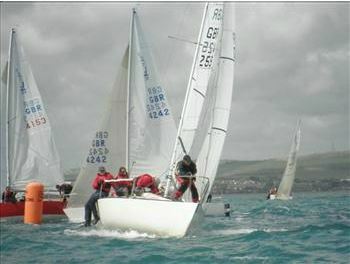 The 2011 J24 National Championships were held in conjunction with the Henri Lloyd Weymouth Regatta from July 7th to 10th. The fun started at weigh in with Tim Brouards crew on JAM keen to get it over with and down to the local chippy. Tim weighing in at an impressive 139k,which I think put the scales out in everyone else’s favour, except for HEDGEHOG crew Jessica who was sent round the block to lose the last kilo even though she only weighed 60kg! SERCO, with European champion helm Nathan Batchelor, came well prepared and won the event. Their 16 year old foredeck and local laser sailor Sam Barker complementing the otherwise very experienced crew of Bob Turner, Adam Bowers and Ian Brown. RELOADED, in second, dropped a place from last year. Gareth Robinson helming with Mark Penfold and Damien Thomson being well supported by Max & Martin Holzer both of who came over from Sweden for the event. STOUCHE, as ever superbly helmed by Stuart Jardine came third overall. Stuart managing to persuade his son Mark and friend James Holah to compete, along with his two old(ish) regular crew, Kenny Roebuck and Graeme Love. 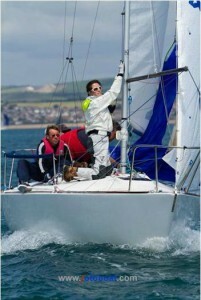 This was Stuart’s last competitive J24 event in the UK. “Stouche” has been sold to an Irish team so will not return after the Europeans in Howth. The AGM was held on the Thursday evening and we were all pleased that Rob Clark, who sails JU JU, volunteered to take on the role of Class Secretary from Stuart. We lost Friday to the weather, the RO postponing for 4 hrs before some had got out of bed, which made for a leisurely breakfast, then abandoning at 1500 for an early beer! However all the fleet had a hard day’s racing on Saturday, completing four races (controversial to some) in 20/25 knots and David Cooper on JAWBREAKER with his secret weapon from Australia, who thought everything awesome, also getting a bullet in race 6. JIGGY WITH IT, the only Westerly in the fleet, hosted a pontoon gathering after racing which was welcome by all for a bit of banter and beer. Sunday brought a more manageable 8/10 knots, we had JACOBITE, Mike Street, winning his first race at a nationals in race 7 and then Andy Taylor on HITCHHIKER winning race 8. The Prize Giving, with generous main prizes from Hyde Sails, was held outside “The Boat That Rocks”, the restaurant adjacent to Portland Marina. The Marina did a great job of launching and recovery with their large forklift for us. We hear plans afoot at Castle Cove Sailing Club for a crane by next year. Watch this space. Thanks go to the Yacht Clubs of Weymouth, especially chairlady of the regatta committee, Nicola Lane, doing that for the first time is no easy job. Also to PRO Derek Abbott & our own RO Adrian Patterson and his team on the Committee Boat and RIB on the J24 Course for 3 days of outstanding course setting and 8 superb races. Next year’s Weymouth Regatta will be the 13th-16th July and all can be assured the J24’s will be back.